Can anyone tell me what kind of squash this is? Last year we planted some hybrid yellow round zuchini. We had one going bad and my husband pulled it and just threw it in the garden. This year we had some volunteer plants from the seeds. I understand that for heirloom seeds you can expect the same variety. The same is not true from hybrid seeds as you can not know what you will get. What these plants are producing is unrecognizable. The squash are 6 to 8 inches long. The shape is identical to a yellow crookneck. However, the skin is green with lighter green or white stripes. I decided to cut in and see what I found. The seeds and skin leave no doubt that it is some type of winter squash. I did bake some as I would winter squash but the flavor wasn't recognizable and was quite mediocre. I have searched high and low on the Internet for different types of squash and haven't found anything close. Does anyone know what this may be or what it could be used for? To me, it looks a bit like a birdhouse gourd, albeit a different variegation. Or perhaps a kabocha squash, which to me has a rather mild and mediocre taste and texture. I guess you've ended up with some wacky gourd hybrid, resulting from open pollination of your desirable (F1?) hybrid. As is the nature of hybrids, the result could be caused by pollination either with itself, or something else in the area. Either possibility could be responsible for the Frankenstein's monster you produced. If you started with a zucchini, you've probably got some Cucurbita (e.g., vegetable marrow as @NBenatar suggests). Have a look at other links from Wikipedia's list of gourds and squashes, or one of a number of gourd identification charts such as this one that will help you narrow it down based on the nature of the inside of the fruit, leaves, etc. Prior to the pic, I was thinking green tiger/Italian striped zucchini (example: http://www.burpee.com/vegetables/squash/summer/zucchini/squash-summer-green-tiger-zucchini-hybrid-prod000907.html) which I recently picked up at my local farmers market. After seeing the pic, I'm leaning towards a Cushaw squash (example: http://www.slowfoodusa.org/ark-item/green-striped-cushaw). It sounds like what you have is a Yellow Round Zucchini F2, potentially crossed with something your neighbors grew. 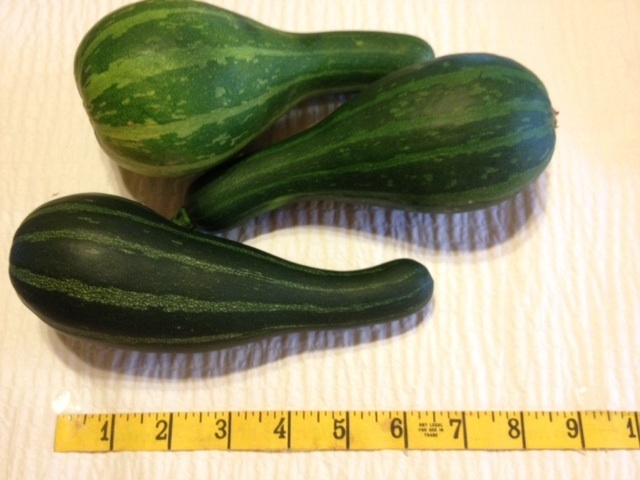 If they came from Yellow Round Zucchini F1 seeds, as you said, they're not another variety you'll find anywhere else. It's your own unique unstabilized breed. Contrary to what sometimes seems to be a popular belief, hybrids never revert entirely to either of the F1's parent varieties exactly as the parent variety was. They may, however, have any number of traits from that ancestor variety, and look /taste practically the same, but they are still different genetically, and not the same variety. Although it's probably not the case, you could alternatively have a mutant. Either way, what the variety is called is up to you. You can name it (but don't expect it to breed true or ever see it exactly as it was this year again, even if you grow more of those F2 seeds, since each F2 seed is different). However, that doesn't mean they're that different. You could probably find similar ones (but you shouldn't name them the same thing if the old name is still in use for the other F2 anywhere). You could work to stabilize the breed, which would take a number of generations. The finished product could be pretty similar (but it would be different, of course, since it would breed true), although chances are there'll be some noticeable differences, however similar it is. As for how to use it, I'd experiment. Onions, peppers, hot peppers, salt, cheese, mushrooms, vinegar, oregano, and butter are some ingredients I find go well with squash generally (for savory dishes). I don't recommend garlic with squash, personally, as to me it gives it a weird taste, but some people like it (although if you must use garlic, I recommend cooking it separately and mingling it into the squash after you cook the squash rather than while you're cooking it; this seems to get rid of that unpleasant chemical taste, for the most part). I do like garlic with other stuff besides squash. Squash have some properties in common with potatoes (e.g. starch). So, experimenting in similar ways might help. I do like garlic with potatoes, though. A lot of people like to stuff their squash or turn it into zucchini bread. I'm sure you could do that here. Some people make soups or stir fry (summer squash is popular in stir fry). It's probably not a pie squash, but pies are popular with squash. I sometimes like to make a squash salsa with squash as the base instead of tomatoes (although I prefer a non-bitter, sweet, pie squash for that like the Long Island Cheese Pumpkin). I add some very un-salsa-like ingredients to it (like mushrooms, cheese, and oregano), but it still tastes like a salsa. It's cooked (not a raw salsa). Pickling is something you could do. You could lacto-ferment it or do it the vinegar way (or both). I would probably add vinegar to it (for extra flavor and preservation time) and lacto-ferment it. Not the answer you're looking for? Browse other questions tagged food-identification squash or ask your own question. What kind of soup is this lady most likely making? Could Someone Please Help me to Identify What Type of Squash This One Is?